Charles Warren Stoddard was born at Rochester, New York in 1843. He began his writing career with various letters and poems, which received high praise. While visiting Molokai he became well acquainted with Father Damien, about whom he wrote The Lepers of Molokai, a work which did much for the priest's esteem. He was received into the Catholic Church in 1867, and held a tender devotion for the faith. 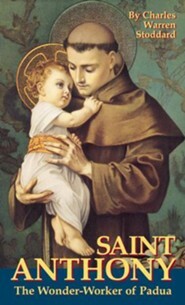 Charles Stoddard is the author of Idyls, A Troubled Heart and How It Was Comforted, For the Pleasure of His Company, and St. Anthony, the Wonder Worker of Padua. He died in 1909 at Monterey, California. I'm the author/artist and I want to review St. Anthony: The Wonder Worker of Padua.